Viol is a closely related but older branch of the same musical instrument families as the violin and viola. 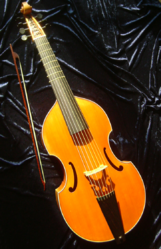 Viols are a bit different in that they have frets (tied, like on a lute) and a lower bridge angle. 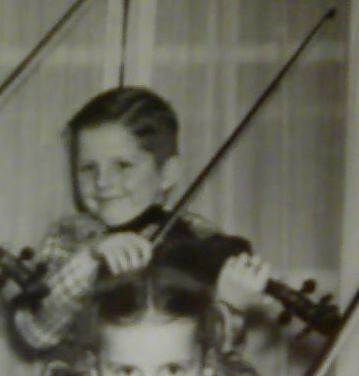 They date from before the violin/viola underwent some evolution as fretless instruments to get more power/brightness. Most of them also are usually played in upright position, at least traditionally. So if you ever wondered what would happen if a violin or viola had frets, you can get some idea from this. The player, Jordi Savali, does quite a few genres very well, not just Celtic music. But with St Patrick's day coming up and all, I thought I'd post this recording I ran across. Interesting to hear an older cousin of the violin/viola, and how it sounds different in some ways and very similar in others. @DanielB That is so awesome. Oh, and before anybody thinks that maybe the tied on frets would automatically make it easier, I should mention that viols usually have 6 or 7 strings. It gives them a wider tonal range and since the fingerboard isn't much wider, it lends to more chording than is usually done on their fretless cello/viola/violin cousins. Instruments evolve, and the conventions of how they are played and tuned come and go. But the music and songs continue on through the changes in instrumental fashion. Very cool. Just had to look up the tune - Gusty's Frolics!! "Viol", AKA, "Viola Da Gamba"
Not sure if this photo will appear here. I took it at my luthier's shop some time ago. nope, I I can't copy and paste, there is no URL, so here's a pic of one identical to it. While I was in Mark's shop, he was tyeing / replacing some of the frets around the neck.